Prairie Rivers Network is among groups seeking a federal appeals court review of EPA rule changes for coal ash waste dumps. A half dozen environmental groups, including Prairie Rivers Network and the Sierra Club, are challenging the Trump Administration changes which give power plant owners more time to clean up leaking coal ash disposal sites. 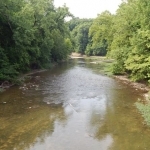 Rehn’s comment referred to the National Scenic Middle Fork River in the area north of Kickapoo State Park. The environmental groups say a recent court order casts serious doubts on the legality of the Trump Administration’s rollback of coal ash rules implemented during President Obama’s leadership. The EPA is now required to draft rules to address more than 100 ‘’legacy’’ coal ash ponds at retired plant sites. The EPA must also address the closure of over 600 unlined or clay-lined coal ash ponds in response to the court’s decision.